Anemia is a major contributing factor to the 200,000 annual maternal deaths and more than one million annual infant and neonatal deaths. While the primary cause of anemia is iron deficiency, the lack of iron in the diet is acerbated by folic acid and vitamin B12 deficiency. Additionally, folic acid deficiency leads to serious birth defects. Recent research indicated that folic acid deficiency can effectively hide the concurrent vitamin B12 deficiency, making folic acid fortification ineffective. Prevention of anemia in women of childbearing age, and in infants, is a key intervention to saving lives at birth. Food fortification is a safe and effective method of upgrading the micronutrient status of a population. It requires no medical infrastructure, or any specific action by the consumers, and is often much more cost-effective. Unfortunately, effective fortification programs require a food vehicle that is universally consumed, at approximately the same rate, independently of economic status. While staples such as oil, flour or rice are widely consumed, their intake is variable, and more importantly, the rural poor often have no access to fortified foods. There are two exceptions: tea is consumed widely across the globe, and essentially by all in South Asia and China, and salt. Salt consumption is relatively uniform within societies, consumed daily, and since it is not home produced, centralized fortification is possible. Over the past 20 years, infrastructure for salt iodization has developed, and iodized salt now reaches 5 billion people – with a dramatic decrease in iodine deficiency diseases. 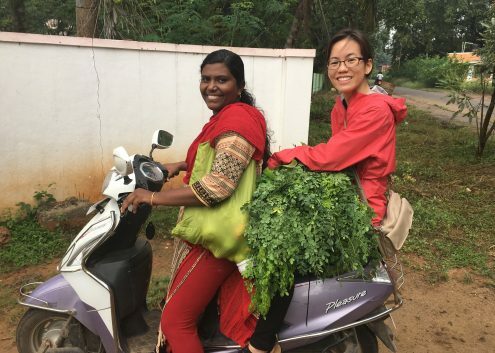 The food fortification team is working on projects to utilize tea and salt as vehicles to deliver iron and a number of micronutrients. Additionally, one project focuses on provision of basic micronutrients in a carbonated drink for use in disaster relief. Double Fortified Salt (DFS): Salt fortified with iron and iodine: The team developed technology for the double fortification of salt with iodine and iron. 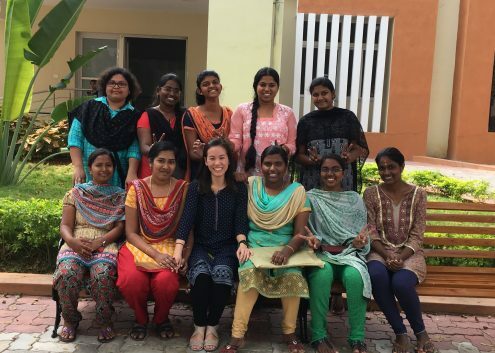 After initial trials at a village level in Ghana by the Micronutrient Initiative, DFS was introduced on a trial basis in the school lunches of 3.4 million children in Tamil Nadu state in India. The program resulted in a 35% reduction in anemia within 8 months, effectively curing one million children. Due to this success, the program has been maintained by the Micronutrient Initiative, and expanded to 5.5 million children. The team is in the planning stage for a field and lab study in Uttar Pradesh state in India, whereby it is hoped that the DSF technology will reach an estimated 10-15 million people. The ultimate goal is to roll out DFS across India, and beyond. 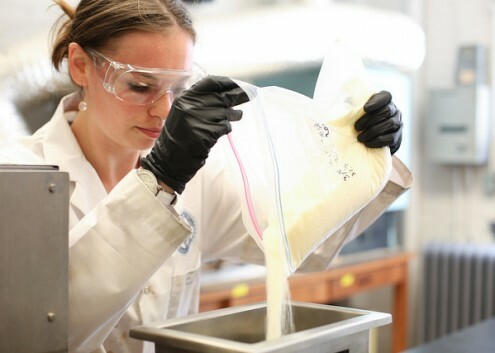 Quadruple Fortified Salt: Salt quadruple fortified with iodine, iron folic acid and vitamin B12: The team received a grant from the Saving Lives at Birth consortium to demonstrate the technical feasibility of salt fortified with iron, iodine, vitamin B12 and folic acid. Quadruple fortified salt (QFS) will provide these micronutrients at levels that will result in a substantial improvement in micronutrient status of women and children. It is clear on the basis of scientific evidence on individual components that while salt fortification will have significant benefits in terms of work capacity and disease resistance for the whole population, the proposed intervention will specifically help save lives at birth, and will, directly and indirectly, benefit infants in terms of survival, reduction of birth defects, disease resistance and neural/cognitive development. The added cost of providing QFS will be less than 20¢/person/year. Tea Fortified with Iron: Tea drinking is deeply engrained in India, Pakistan, Bangladesh, Sri Lanka, China and elsewhere. Unlike iron fortified rice, which primarily reaches urban populations, tea consumption in South Asia is widespread and independent of social status. People typically consume 2 cups of tea daily, and thus it presents an opportunity for effective iron delivery at levels that are safe and effective. 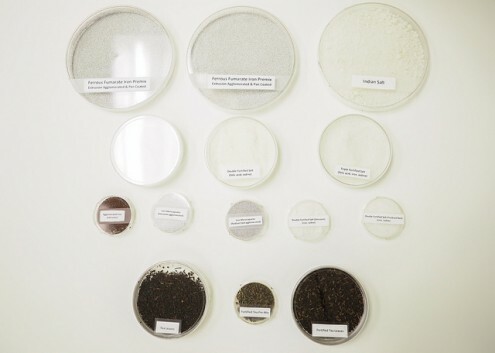 Previous attempts at tea fortification failed due to the interactions between phenolic components in tea and iron – reducing iron bioavailability – and also changes in taste and colour of tea upon iron addition. 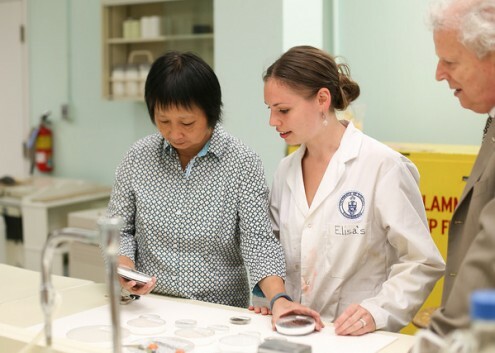 With support of a grant from Grand Challenges Canada, the team is developing technology for adding iron to tea in a way that overcomes these challenges. Iron fortified tea can lead to the provision of 30-100% of the daily requirement of iron in a way that is transparent to the consumer and will in the long run result in a minimal increase in the cost of tea – all at an added target cost of 10-20¢/person/year. Preservation of Nutritional Content and Taste in Preserved Moringa: Progress on evaluating Moringa oleifera as a channel for food and nutrition security was split into three phases in the past year: nutritional content analysis, processing of Moringa Cubes, and evaluation of nutritional and physical characteristics in Moringa Cubes. 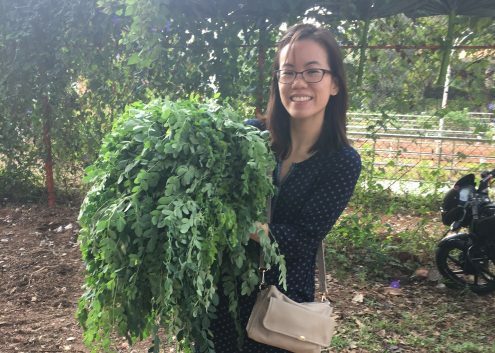 Samples of Moringa oleifera leaves and pods were collected from multiple regions. Proximate and mineral analyses were done on the samples collected. By the end of 2017, it was conceptualized that the edible components of Moringa oleifera could be incorporated into bouillon cubes as a fortificant for minerals and vitamins. At the beginning of 2018, cold extrusion processing was explored as a way to form Moringa oleifera-fortified bouillon cubes, now referred to as ‘Moringa Cubes.’ Multiple formulations containing varying amounts of Moringa oleifera leaves, pods and binder were tested. 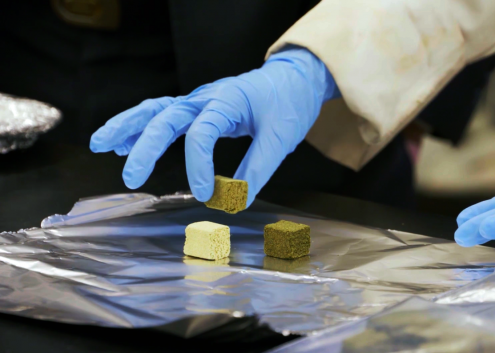 The formed Moringa Cubes were characterized for their nutritional and physical characteristics benchmarked by commercially available bouillon cubes. This initial concept proof for Moringa Cubes was successful and studies are ongoing to optimize formulations and processing conditions. Live Ade®: Many people in Asia and Africa are lactose intolerant, yet much of humanitarian aid is based on dry milk powder. 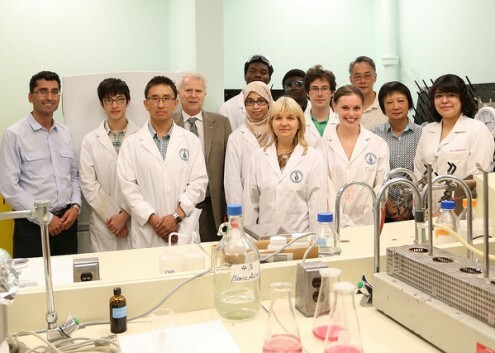 The team is working on a high-protein drink-base that can provide added micronutrients in a carbonated beverage. Mustard is a heat and drought-tolerant crop that has a well-balanced amino acid distribution, some in the form of unique acid-soluble proteins. 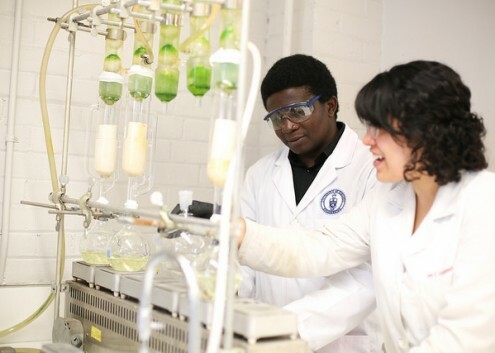 The oil is unsuited to human consumption but is ideal for biodiesel production. 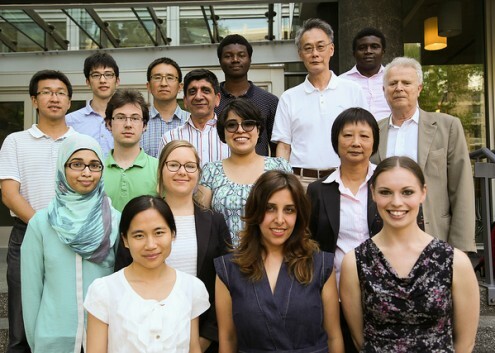 The team is developing technology to simultaneously recover a food-grade protein and biodiesel from mustard seeds. The acid-soluble protein isolate, with added micronutrients dissolved in a juice or carbonated water will be an ideal complementary drink. The name Live Ade® was suggested and registered for the group by Claire Kennedy.